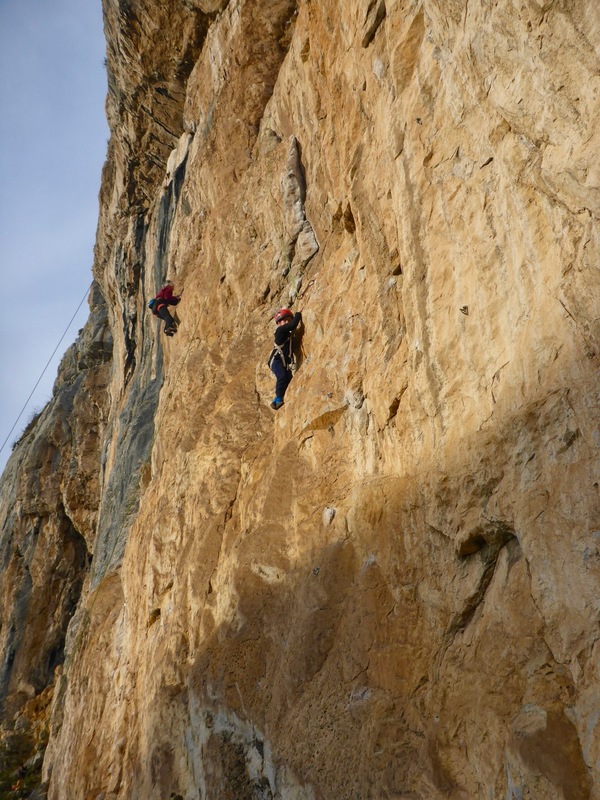 After heading up to the snow at the weekend, midweek was ripe for some sunny sports climbing and what better excuse to get out on the rock on a school day than two public holidays that convert into an epic ‘Puente’ long weekend. So Wednesday saw us meeting up with friends at Muro Techo in Teverga. Parking for the crag is at Sobrevilla village, a 20 minute drive from Casa Quiros, and the walk in is a steady, mostly flat, 20 minutes. It’s one of the longer walk-ins in the area but hardly epic and also makes for a nice little warm up on cooler winter days. Our current guests, Tony and Sarah, are here for a three week stay and with their motto of ‘to rest is to rust’ they have been steadily ticking their way through the local crags whilst climbing pretty much every single day. No wonder I caught Sarah sneaking a power nap in the sunshine before cranking on! 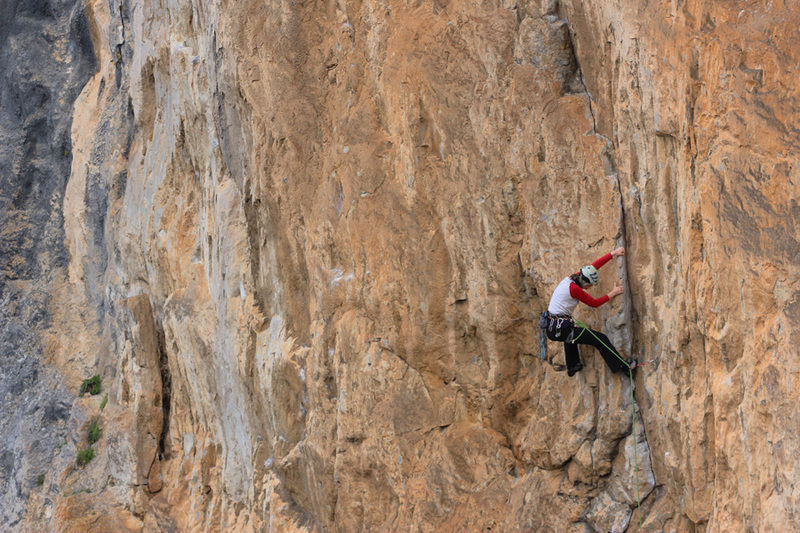 In the pic below you can see our Jack in action at the end of the day on the lower section of the ‘Clásica de Muro Techo’ – a spicy little 6a pitch. And there’s Sarah in the background on the lovely, friction-laden 6b ‘El Costo de la Vida’. The other important fact that you need to know about Muro Techo is that not only does it catch all the afternoon sun going, it also stays dry in the rain. 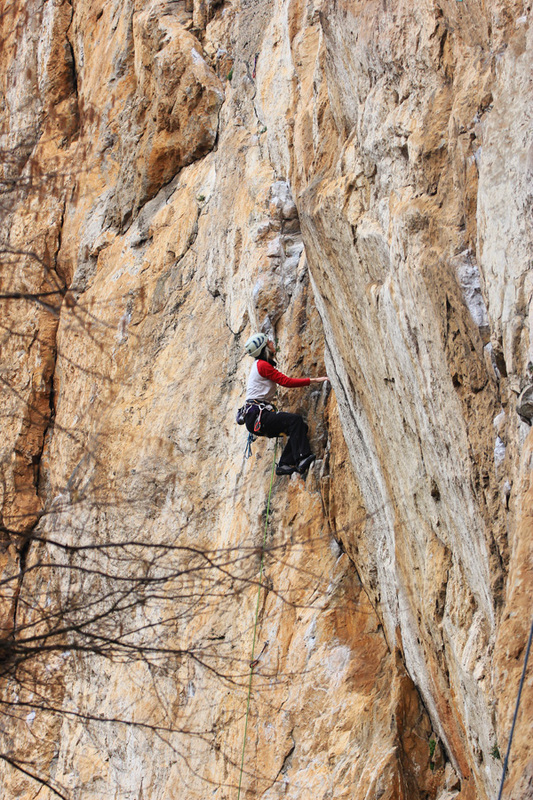 Whatever the weather there’s always somewhere great to climb in Los Valles del Oso! This entry was posted in Climbing Blog, Valles del Oso and tagged Asturias, climbing, family, holiday, Muro Techo, northern Spain, rock climbing, sports climbing, travel on December 8, 2017 by admin. You’re probably tired of hearing us telling you how great the rock is round here, how beautiful the area and how cosy the lovely cottage that is Casa Quiros so let me just hand over to our most recent guests so they can share their experience with you in their own words. This entry was posted in Climbing Blog, Reviews, Valles del Oso and tagged Asturias, climbing holidays, holiday accommodation, holiday cottage, holiday rental, northern Spain, review, rock climbing northern spain, sports climbing, video review on January 19, 2017 by admin. 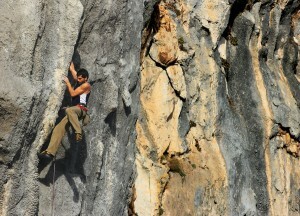 Not every day’s climbing is about ‘sending the gnar’ (as some of our American friends like to say ). Sometimes just getting to the crag can be an achievement in itself. Take the other Saturday. I was here in Casa Quiros, car-less and partner-less, all set for an afternoon of house-bound pottering with our 6 year old son when I was messaged by some friends, a group of mums who climb. Turned out they were heading cragging here to Quirós. The perfect excuse to ditch the duster! 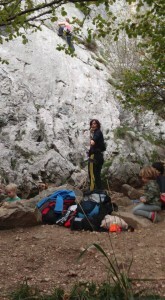 3 Mums climbing with their 4 kids – mission accomplished! It was a beautiful afternoon so, even with an easily-tired six year old in tow, the walk from Casa Quiros to the base of the crag was a pure delight. We caught up with our friends halfway along the path – two brave mums with 3 small children. Brave because the first rule of doing anything with children (imho) is try and not let them outnumber you! This goes double for climbing but despite the odds being stacked against us we made it pretty painlessly to La Selva. La Selva sector is a great spot for families and beginners with a wide, tree-shaded base at the foot of the climbing and a ton of easier routes, including some very fine slabs that go at between grade 4 and 5. The perfect place for setting up camp for an afternoon. Climbing in a three meant that there was always one mum with her hands free to supervise the four little ones, who ranged in age from 2 to 6. To be frank, this task would make sending sevens seem easy but sharing it between us and breaking it up with some 5 star routes helped preserve our sanity! 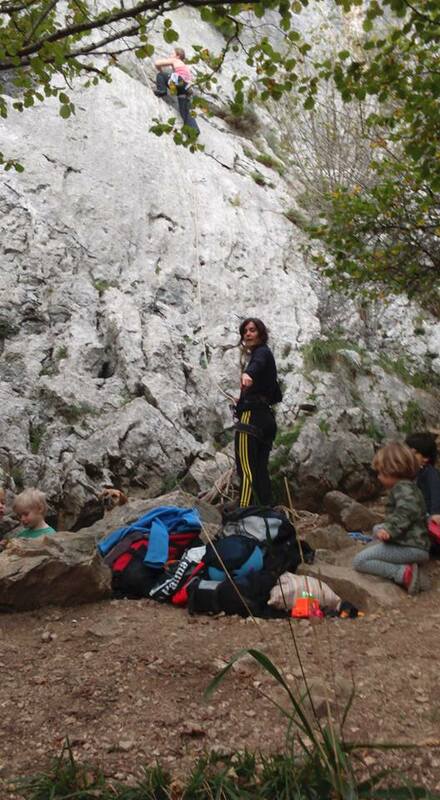 This entry was posted in Climbing Blog and tagged Asturias, children, climbing, climbing with kids, family friendly cragging, holidays, Quiros, rock climbing, travel on November 22, 2015 by admin. “We stayed at Casa Quiros at the end of September this year (2015) and certainly echo all the very positive comments already posted. The house is in an amazing rural location, with stunning views, and a really peaceful place to spend time when you’re not on the crags. 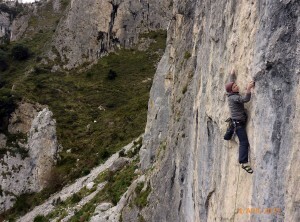 The local crags are brilliant, well-bolted, unpolished, solid limestone. We also enjoyed travelling a little further afield through fantastic mountain scenery to climb in Leon. As Dave said we had a lovely afternoon climbing together and Dan even managed to throw some great shapes on one of the routes we did – enabling me to snap a few nice pictures. 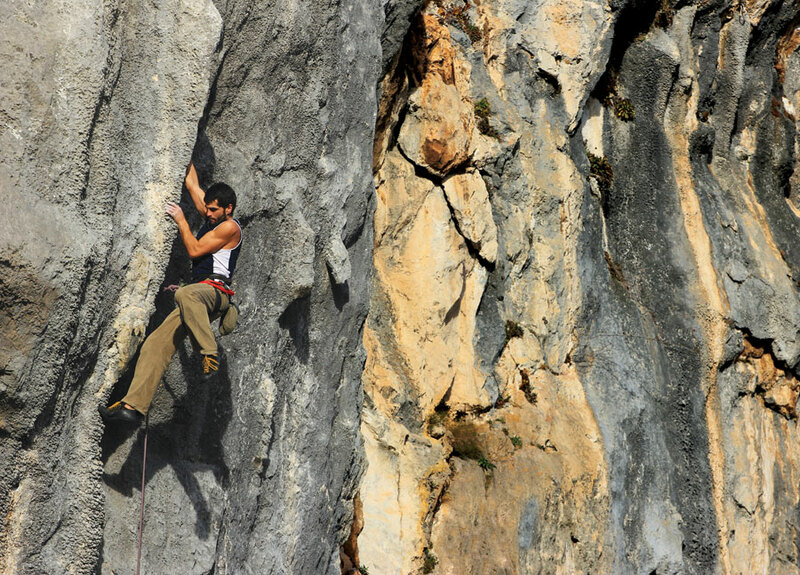 This entry was posted in Climbing Blog, Reviews on October 5, 2015 by admin. 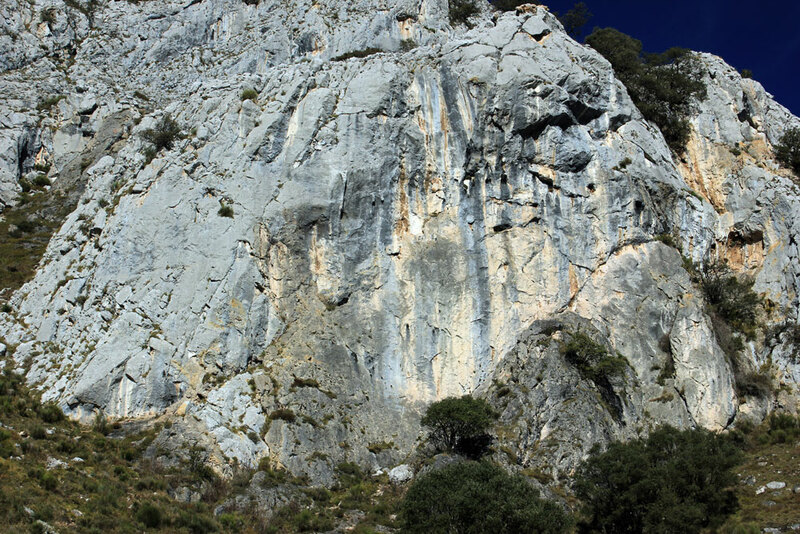 There a ton of climbing at Quirós, the climbing area that’s closest to Casa Quirós, just a ten minute walk. 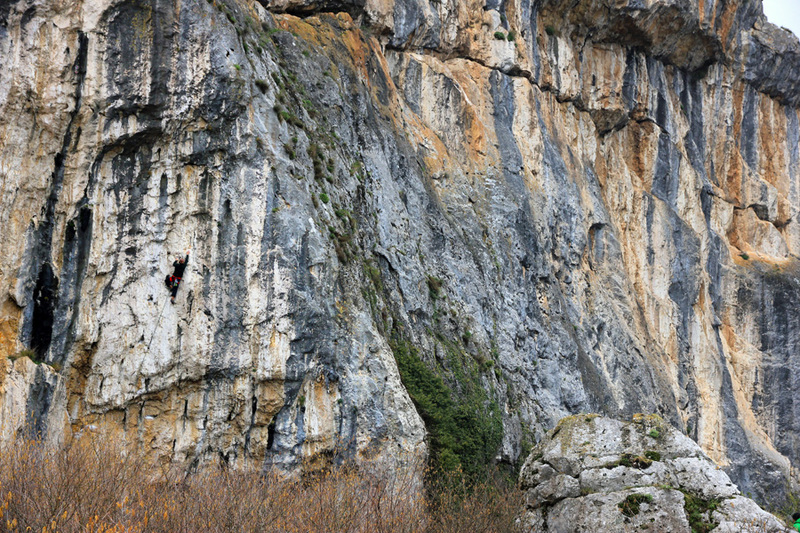 It’s still one of the most popular places to climb in Asturias even though it’s one of the longest established. As there’s so much there i’ts worth getting a bit of a sector by sector overview and so I’ll start with La Cubana. This is one of those sectors that’s got a bit of everything – from your first 5 to an 8a+ roof – and because of that it seems a lot bigger than it is. This is also probably because most of the routes are really good, and in fact there are two or three that are ‘must do’ routes of Quiros. It’s actually a pretty small sector but because there’s quite a bit to go at and the routes are short, I always tend to have a good time there. 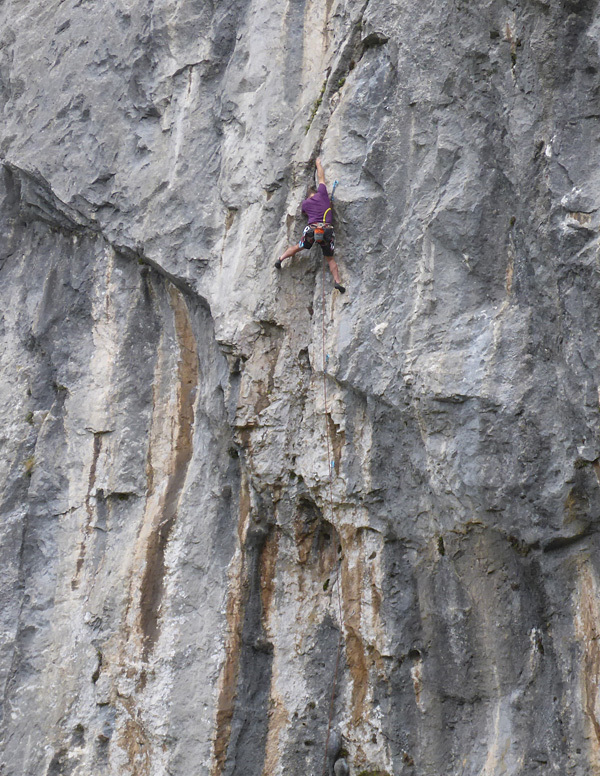 Denise, an English friend, and my partner Mary got there first and had already sent Mao and Tao, two great little 6a pitches on the high-quality grey limestone that bounds the left had part of the sector. And when I arrived Den was just setting off the classic Sol y Nieve, 6c, which takes a line of thin holds up a vertical wall. Balancy and delicate there´s a couple of hard pulls and it’s a bit of a vertical puzzle. I followed, leading the route for about the 4th time, and although I knew it, the off-balance nature of the climbing and the delicacy of the moves means it’s never in the bag until the chains are clipped. 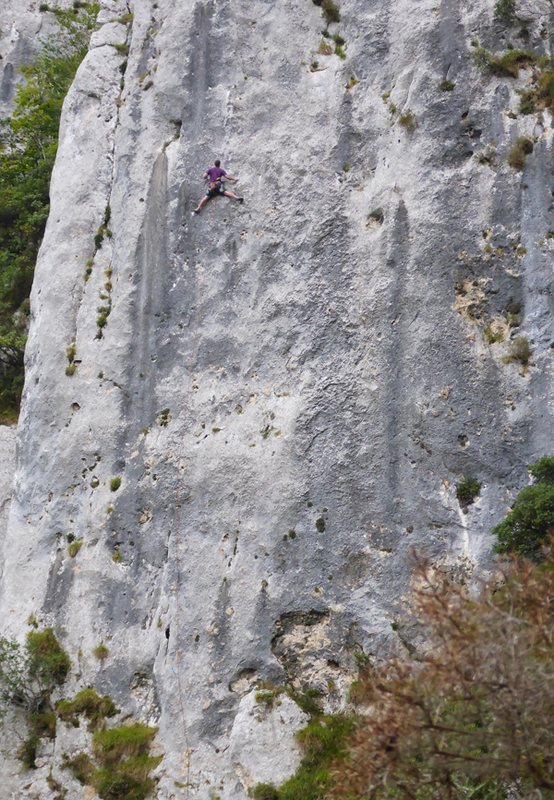 Suitably flash pumped I decided it was Den’s turn again and sent her the brilliant Corazon Salvaje (Wild Heart), 6c+. 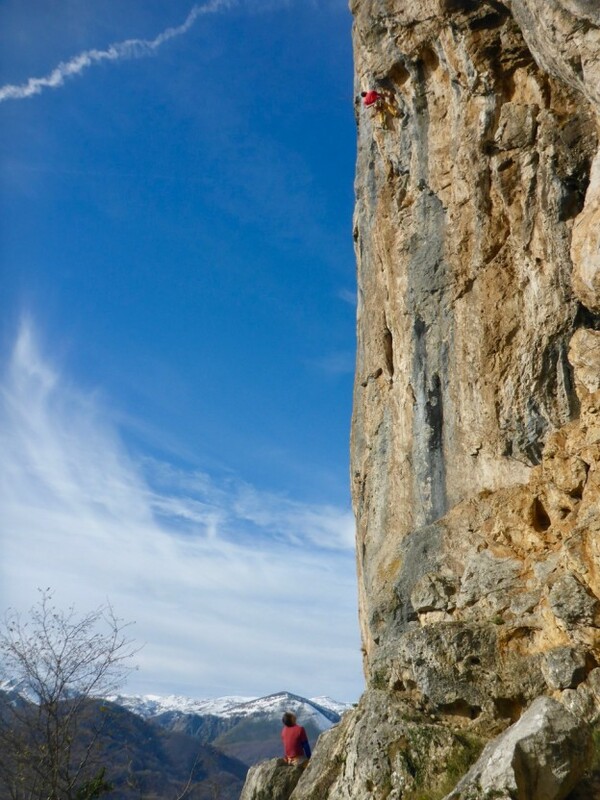 This is an unusaul route for Quiros and one of the best there, involving some burly pulls on an ever steepening tufa. Sharp and committing Den almost had it but just failed to latch the key part of the tufa. Cold hands and sharp holds almost certainly playing a part! I did the route quickly after Den and emboldened by warm hands, and owing Den a favour, I offered (was persuaded) to put the clips in the very fingery 7a, Brutus. Like a thin version of Sol and Nieve Brutus is, well, brutal! Luckily on the attached video you can’t see my poor efforts where I fell before the crux but this gives you an idea of the nature of the climbing. Anyway hats off to Den who sent it first go, flashing it and ending up very pleased with her days haul. Another great day out, a mite cold but some sweet routes in the bag. 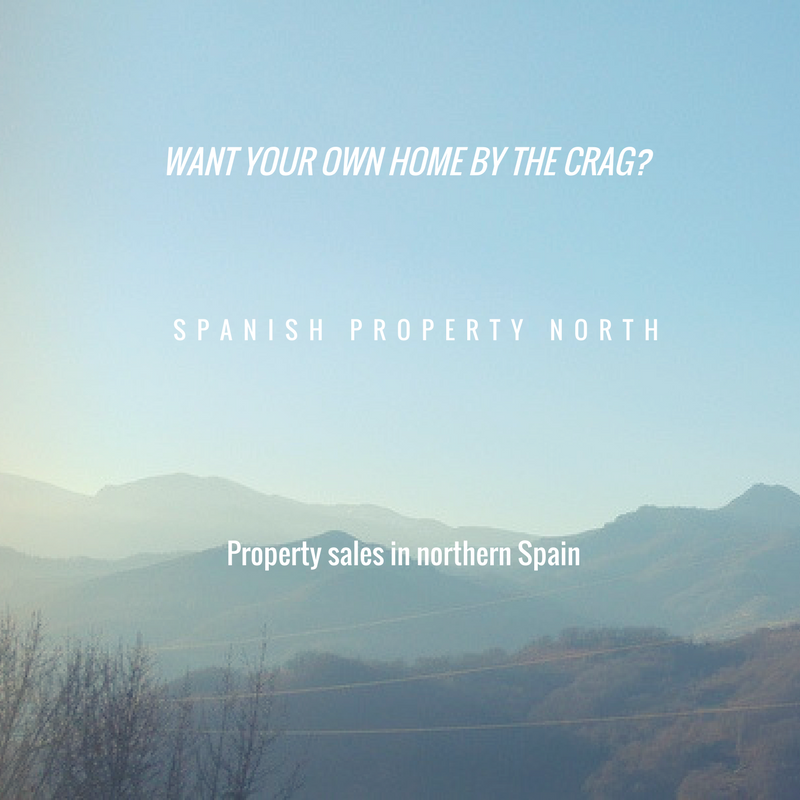 This entry was posted in Climbing Blog and tagged Asturias, CLIMBING NORTHERN SPAIN, CORDILLERA CANTABRICA, holiday accommodation, holiday cottage, Quiros, ROCA VERDE CLIMBING, SPANISH CLIMBING, SPORT CLIMBING, sport climbing Northern spain on May 10, 2015 by admin. As the author of the Roca Verde climbing guide (as well as the owner of Casa Quiros) we decided to make some videos about climbing in the area. There’s not too many about and very made by Brits so I tought it would be a nice thing to do. 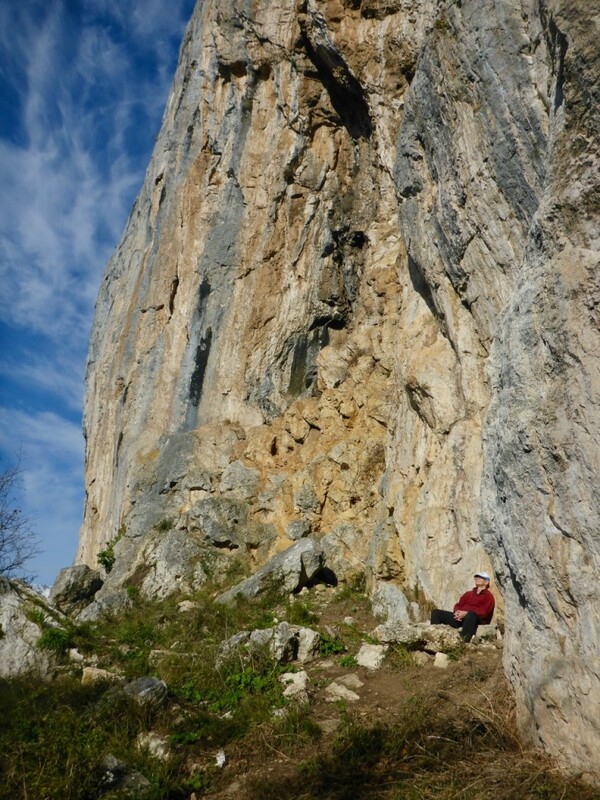 Here’s the first one I’ve done – it’s me on one of the super cool routes at the Sector Las Ardillas, at the crag of Quiros in the heart of Asturias. I’ll be making plenty more videos from now on – and hopefully learning more on the way – and you can see more at my YouTube channel. 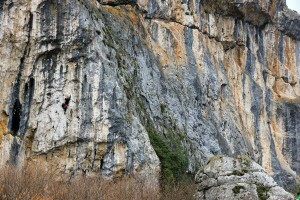 There’s about 30 videos that I have found – of varying quality – that show some of the climbing in Asturias and beyond. This entry was posted in Climbing Blog and tagged Asturias, casa quiros, climbing at quiros, CLIMBING NORTHERN SPAIN, CORDILLERA CANTABRICA, ESCALADA ASTURIAS, ESCALADA DEPORTIVA, holiday cottage, holiday rental, Quiros, rock climbing northern spain, SPANISH CLIMBING, SPORT CLIMBING, sport climbing Northern spain on May 6, 2015 by admin. It was fantastic, finally, to greet our first guests into Casa Quiros a couple of weeks ago, after what seems like a long time directing builders, preparing and doing DIY on the house. Luckily they were impressed and have been very happy with the house and even commented that it’s much nicer than on the website. Even more special was to be able to go climbing with and show our guests some great routes at one of the sectors that maybe they wouldn’t have gone to. Nicola and Rodger had climber for a number of days at Quiros and been very impressed by the climbing, the fact they could walk to the crag and maybe most of all the quality and lack of polish. However, due to the fact the day I picked to climb with them was a day that it had chosen to rain and generally be miserable I had to use my local’s knowledge to pick out a spot which I knew would be climbable! I decided our best bet would be Muro Techo, a great crag – one of the 25 sectors at Teverga and only a 10 minute drive form the house. Looking much like the UK’s Kilnsey crag, with a large roof above a vertical wall, it’s a sector that sometimes forgotten because it’s a bit of a hike (20 mins). I was pretty psyched as well as it was my first day climbing after managing to saw my finger with a jigsaw whilst starting to build a board at Casa Quiros – still to be completed!! I’ve climbed there a lot, and especially in summer when its orientation means it doesn’t get the sun until around 1.30pm, so you can bank on a good few hours shady climbing. However, on a cold day (or when there’s a bit of rain), it can also come into its own as it is both sheltered and, due to the jutting roof that guards it, virtually never gets wet. In fact you can basically climb in the pi**ing rain there and have a great day. And on this day, mid-March is was both cold and rainy so we headed up there to sample the delights! In general the rock at Muro Techo is very good, and tending towards the slabby it’s a technical and delicate climbing style. And with a preponderance of routes up to 6c on the main walls there’s plenty to go at. As usual we warmed up on the short and sharp 5+ first pitch to Ambigut- a steep crack, it’s a good way to get the arms working. 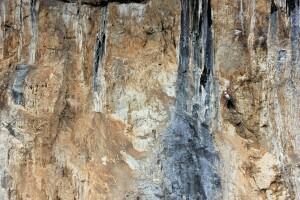 I then took Nic and Rodger over to the Clasica de Muro Techo 6a, 6a+. Even upgraded to 6a the first pitch is a tricky proposition and a bold layback and difficult clip adds meat to this good route. However, with the clips in Nicola stormed it but appreciated my warnings of the potentially stopper move! Just after this my friend Ramon pitched up and bizarrely enough had been climbing next to Nicola only a couple of months before at El Chorro. Introductions were made and then Ramon headed up to try Ambigut – this time the 2nd, 7b, pitch. And although a lot of Mure Techo is slabby at the right hand end there’s plenty of steepness with a series of routes of ever-increasing difficulty though some tough roofs. Ambigut V+, 7b is the most accessible of these and Ramon attacked it with gusto – only coming unstuck on a particularly fierce mono move near the top. Our team then moved onto Llagartu Verde, a sweet little 6a, 6c whose first pitch is a superb exercise in slab climbing. This time I took photos while Nicola sent the first pitch without too much trouble and came down singing its praises! Finally, it was my turn to climb and I chose to finish on Hierro y Fuego, 6b, a great little route which wends its way up the centre of the main part of the crag. With two tricky sections and some rock which is a little ‘different’ it’s quite a challenging route. Nicola followed me and finally came unstuck as a combination of a cold day and a couple of pumpy layback moves did for her! However, she was not downhearted and both her and Rodger, who had been surprised to be able to climb on what was a pretty miserable day, were pleased to get out and tick some pretty cool routes and visit a different crag! Nearing the top of Hierro y fuego…it’s a big wall!! As we walked down, we christened it a ‘British/Spanish day’ cold but climbable and headed off to enjoy a very, very thick cup of chocolate in the town of San Martin below! 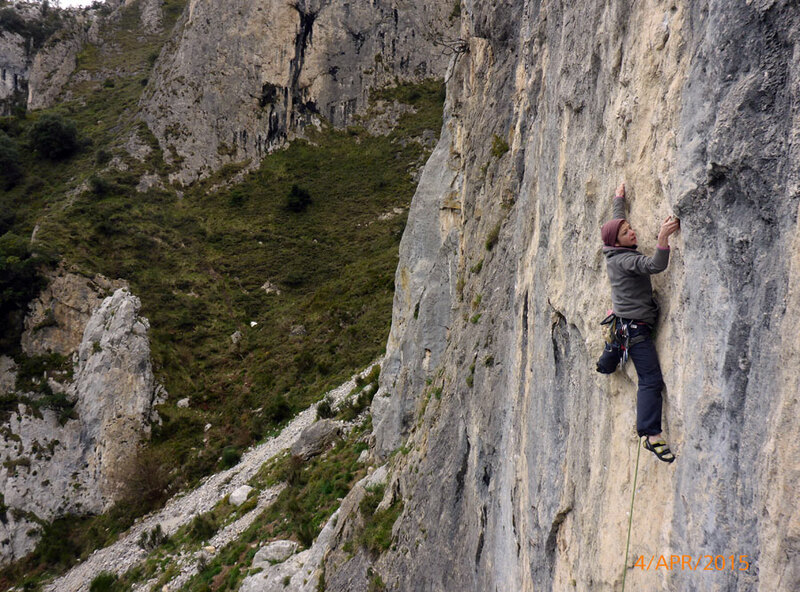 This entry was posted in Climbing Blog and tagged Asturias, casa quiros, CLIMBING NORTHERN SPAIN, CORDILLERA CANTABRICA, ESCALADA ASTURIAS, ESCALADA DEPORTIVA, ESCALADA ROCA VERDE, holiday cottage, holiday rental, rock climbing northern spain, SPANISH CLIMBING, SPORT CLIMBING, sport climbing Northern spain on March 22, 2015 by admin. 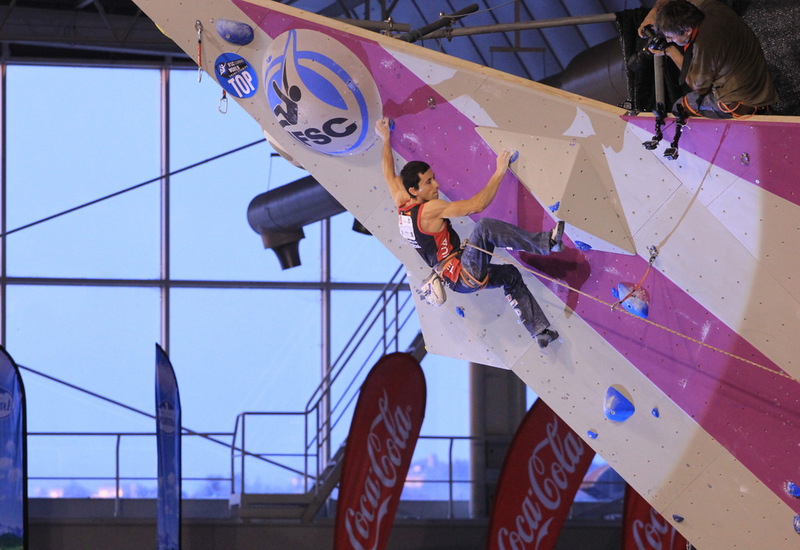 Such is the nature of competitions that once again the best men and women won, but there was much more to it at a tense, exciting and inspirational climbing IFSC World Championship held in Gijón in northern Spain last weekend. 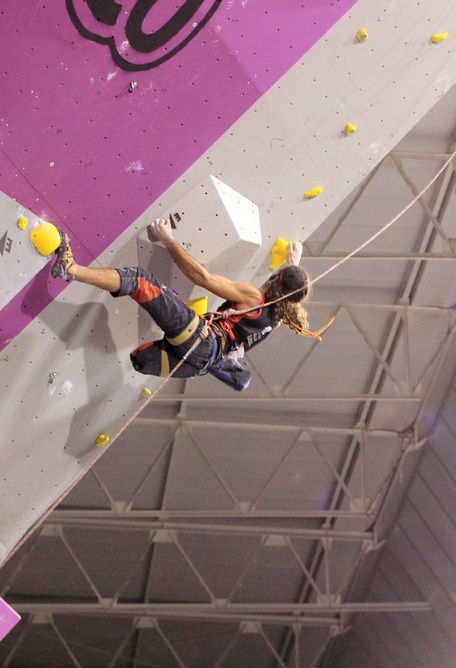 The World Championships which were in Asturias in northern Spain for the 2nd time featured Speed Climbing, Para-Climbing and Lead Climbing were well attended throughout. And although some felt there was a slight lack of competitors in the main categories due to scheduling between boulder comps there was strong field and the finals had most of the big names. 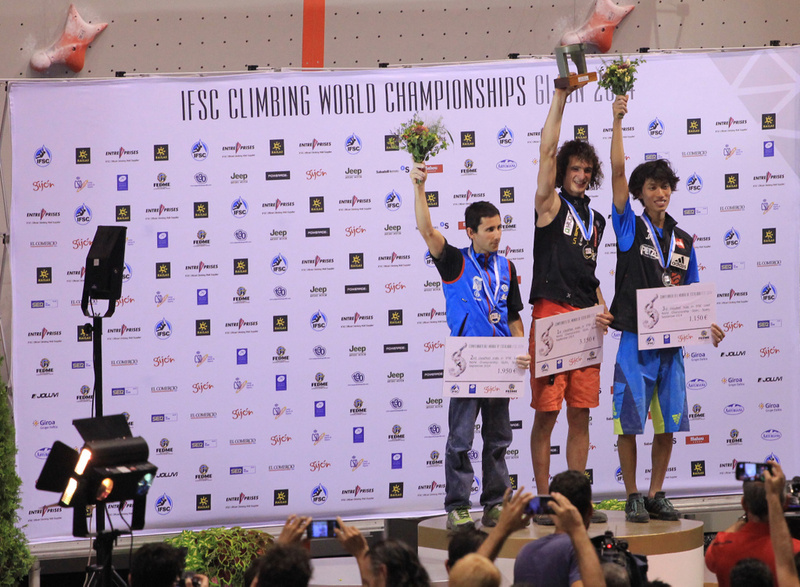 And although a partisan crowd on Sunday didn´t see their favourite, the diminutive powerhouse Ramonet, win, an equally vociferous (though smaller crowd) on Saturday did see their new hero, Urko Carmona, crowned world champion in his para-climbing class as the last act of a long and inspiring day. Interestingly, the Speed climbing, though it was the first time it had been in Spain was over with early on with the Para Climbing taking pride of place on the weekend. Speed climbing was on Friday and this was the first time any Speed Climbing had been seen in Spain meaning that mouths hung open as the crowd realised what speed in climbing actually meant. The world record, recently broken, fell again in the men´s final as the Ukranian, Danylo Boldyrev, overcame the Russian challenge (things to come?) to take 1st. The womens’ went to form with the strong Russian Alina Gaidamakina beating two Poles and keeping it pretty much an eastern Bloc muscle –fest! So Saturday instead was Para-Climbing and in many ways the para day proved the highlight of the competition especially because the large mainly Spanish crowd got the see their man win. A long and tiring day in hot conditions took it out of the climbers but the reaction and size of the crowd made it an event to remember for most and there were several stand-out performances that really raised the bar (and roof). Fran Brown cemented her place at the top table with a very close win, adding a world masters to her current world champion status on the last hold; Koichiro Kobayashi the Japanese climbing brilliantly in the B1 category (visually impaired); and Urko sealing an emotional day with his top out in the amputee class. Urko’s win provided the proof that Para Climbing can sit of the same stage and be equally thrilling as any other category. Hearing the crowd chanting Urko’s name signalled that they were 100% in accord with the competition and not in a way that suggested platitudes: this was a climbing comp and they wanted to be part of his win!! This was a very well-attended event, with para-climbers from as far afield as Iran, Japan and the USA, being exciting and inspirational in equal measure. And with a bit of bias it was great to see the British team do so well. A big team went and managed to claim 6 top three placings – a testament not only to their dedication but to the work put in by the BMC in making sure their cause is pushed so that para-climbing gets the same status and ‘game-time’ as the able bodied version. In the end the full British team results were: Alex & Phil 6th & Adam 7th, Dave 4th , Fran 1st , Sianagh 3rd, Nick 2nd , John 3rd , Esme 3rd & Reanne 2nd. A brilliant set of results and Wild Country is very proud to have been able to support this talented bunch. Finally came the lead comp and a big crowd braved an enormous thunderstorm to pack the pavilion. The women’s competition seemed close at first as height was gained incrementally, climber by climber, but no-one seemed to have the key to the 8b climb. But then out strode Jain Kim, the final competitor, and with a precision, fluidity and strength unseen so far she simply blew everyone else out of the water; topping out in a style that had everyone in the crowd on their feet. In the Men’s final it seemed as though everyone was waiting for the stars and although the competition was fierce it wasn’t until the last two appeared that things really hotted up. A partisan crowd were obviously all for Ramonet but this didn’t mean they were exactly anti-Ondra and his smooth ascent past Scahi Ammi’s high-point to latch-and-leap from the penultimate hold brought cheers from the crowd. Cheers which then turned to roars as Ramonet stepped up. His contrasting ‘locky’ style seemed initially at odds with the route yet as he edged higher the unbelievable athleticism of the tiny figure became obvious and, making it look easier than anyone, he looked destined for the triumph the event fervently wished for. Yet at the same high point as Ondra his trajectory changed, and unlike the formers leap to claim his ‘plus’ the Spaniard found himself on the end of the rope without having persuaded the judges he had the same control as Ondra, leaving an emotional Adam as double world champion! The highlight for me, however, wasn’t the climbing, but what the climbing did. It was brilliant listening and talking to climbers who were exiting the para event, quite obviously inspired, and hearing them discuss training and how they could try to utilise the skills of para climbers to learn to climb better (training with one arm, one leg, blindfolded) rather than mouthing platitudes of sympathy or a ‘oh didn´t they do well’ attitude. 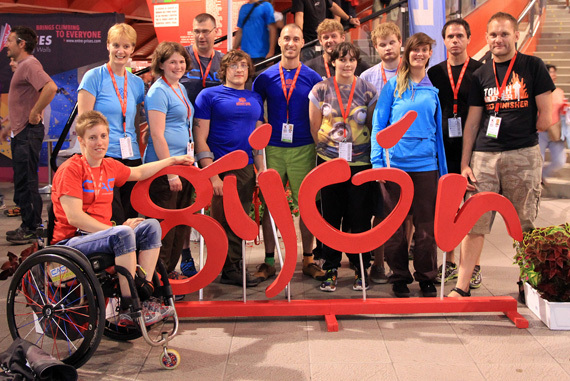 Climbers inspiring climbers – the true meaning of a World Championship! 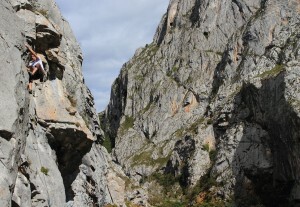 This entry was posted in Climbing Blog and tagged CLIMBING NORTHERN SPAIN, ESCALADA ASTURIAS, ESCALADA DEPORTIVA, ESCALADA ROCA VERDE, ROCA VERDE CLIMBING, SPANISH CLIMBING, SPORT CLIMBING on September 20, 2014 by admin. Returning to Quirós after a break from climbing was a treat for me for a number of reasons; firstly I completed my project, secondly I warmed up on a route which felt pumpy as hell on the last visit and finally I had the same feeling repeating a route as the first time – which is rare. 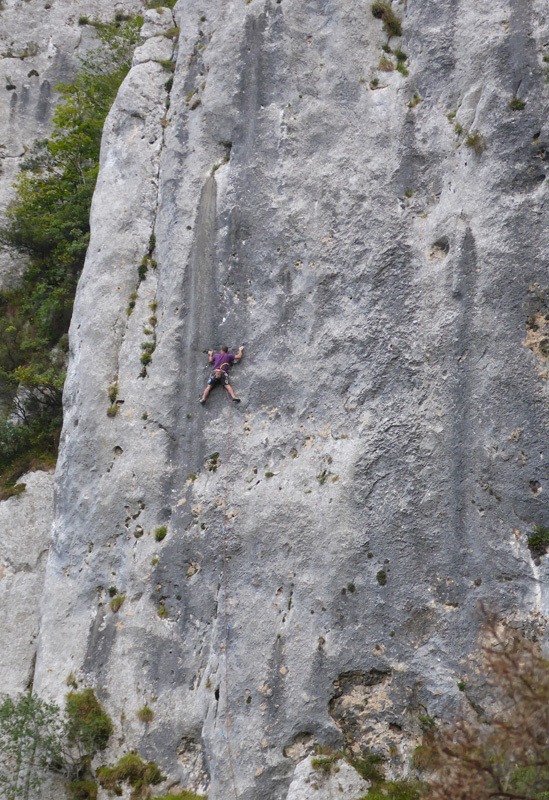 However, for me it has a great mix of routes, there’s a decent spread of grades and possibly the best 6c+ in Asturias. (Controversial!!!) And one more thing I should mention, it also gets into the shade at around 1.30, a blessing for a keen climber in the summer months. So on my first of two quick visits I warmed up on Amanita 6c+, a really good (and long) route which takes a burly crack for fully 35 metres. I had done it a few years ago and it was certainly easier the second time – there’s big moves, finger jams and intricate slabs and was happy that I felt solid all the way. 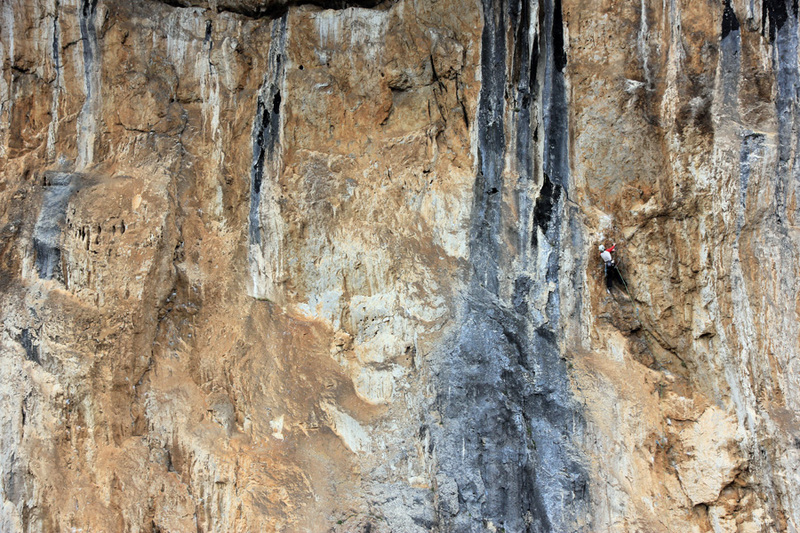 I was happy because I’d returned to finish a route I’d bolted about two years ago – called Chorrera Negra I’d tentatively graded it 7a and put it in the guide even though I’d not had time to complete it. I’d had the time after bolting to top rope it and although very tired had just about done it in one go. So although I thought it may be tricky since I was feeling good I thought I’d just whip up it quickly and get it ticked. However, I hadn’t counted on the fact that A. I hadn’t cleaned it brilliantly and the intervening 1.5 years would leave it worse. And B. it was pretty badly bolted with spaced bolts meaning you had to do hard moves above them and C. it was bloody hard!!! Up, down, up down, I got pumped and more pumped. – feet on nothing much, dirty hand holds and fear keeping me down. Finally I committed and managed to push on – brutal – but a decent crimp got me clipped and a carried on. Phew, crux done! I didn’t remember anything else hard until the last few feet so felt a bit happier. But, I was once again subject to memory failings as almost isntantly the territory became thin, precarious and very, very unobvious. Sketch by sketch I advanced and slowly but surely i was going to be mine. By the end I was totally pumped with cramping feet and it was will power nothing more (and the threat of having to come back) which got me up it. Very relieved I snagged the belay and lowered off pleased as punch but damn tired. I was very proud of my route and my determined effort, whilst acknowledging it’s failings and vowing to come back and clean and add a bolt or two to my ordeal. So overall, maybe my first new route on the Queen of Asturian crags isn’t the greatest but it’s intricate and fun (in an old school way). 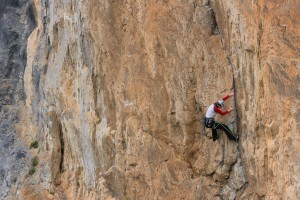 I upgraded Chorrera Negra to 7a+, I am going back soon to ‘sort it out’. This entry was posted in Climbing Blog and tagged Aciera, Asturias, CLIMBING NORTHERN SPAIN, CORDILLERA CANTABRICA, EL LLANO, ESCALADA ASTURIAS, ESCALADA DEPORTIVA, ESCALADA ROCA VERDE, NEW ROUTES, Quiros, ROCA VERDE CLIMBING, SECTOR ECLIPSE, SPANISH CLIMBING, SPORT CLIMBING on September 10, 2014 by admin.